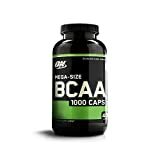 There is no difference between BCAA supplements for women and BCAA supplements for men. The only difference is the amount you should take. Generally, women only have to take about half of what men take, but that will ultimately depend on your size. Branched-chain amino acids or BCAA’s, consist of three proteinogenic amino acids; leucine, isoleucine, and valine, which is considered to be highly effective in helping gain and maintain muscle mass during weightlifting and bodybuilding. As with any supplement, it is important that you only purchase products from reputable manufacturers. To help you choose the best BCAA supplement, we’ve ranked and reviewed the 5 most popular BCAA supplements for women below. If you want a product that can be used anytime anywhere, go with Optimum Nutrition Optimum Nutrition BCAA Capsules. This splendid supplement can be taken before or after training and is designed to give you a shot of energy pre-workout and kick-start your body into a condition of protein synthesis, leading to increased muscle growth. With Optimum nutrition, it is assured that you will feel stronger and more focused, yielding a better performance in the gym. The most popular product from the Optimum Nutrition BCAA supplement range is the 1000mg | 400g capsule option as it’s affordable, easy to take and come in a pre-measured amount, making it easy to control your daily intake. The product is well-known for increasing muscle size and improving the muscle recovery rate, decreasing soreness after a workout to such a degree that you can train hard every day. The same product also comes in a powder format for those who prefer to measure and control their own quantities. One of the best BCAA supplements on the market has got to be BulkSupplements. This particular product is all about quick absorption, energy, and promotion of muscle growth. The BCAAs are quickly taken in by the organism, and they immediately get to work. The amino acids stimulate your metabolism and increase muscle growth greatly, allowing you to accomplish your goal sooner. But the amino acids have other benefits. BulkSupplements’ amino acids better your energy, allowing you to work out for longer and to work out with more ardor. The supplement also allows for recovery, as bodybuilding takes a toll on your body, and tissue damage occurs. BulkSupplements makes sure the damage is minimalized, yielding faster recovery and better results. If you’re looking for a pure BCAA supplement without the added caffeine, then BSN Sports Amino X powder is just the thing you need. Many products add caffeine, but this is sometimes a slight inconvenience, as the caffeine can make you jumpy, especially if you work out late. Instead, BSN Sports wanted to create a supplement that will provide energy to your body completely via the amino acids. As we explained BCAAs are absorbed very quickly, and their effect is very swift. The supplement will make you feel energetic, and your body will be able to work more efficiently for a longer period of time. It will also promote increased muscle growth, with the addition of a proper training regimen and diet. Remember, these supplements aren’t tiny miracles in bottles – they’re more of a support for your body to be stronger and more efficient. 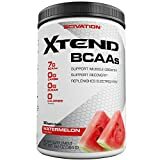 Note this is a general Amino Acid supplement, which means it contains BCAA’s as well as other beneficial amino acids, but in different quantities than BCAA specific supplements. Next up, it’s the BPI Sports’ Best BCAA Powder. 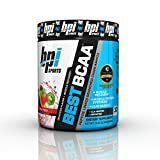 This powder has been carefully made to incorporate the best BCAAs (hence the name) that will promote the fastest muscle growth and give you the greatest surge of energy. The supplement contains leucine, isoleucine, and valine, all of which are vital for the production of proteins, which, in turn, betters muscle growth. However, no supplement is effective if it’s not absorbed in time. That’s why BPI Sports’ powder is super easy to absorb and assimilate. This ensures that your body gets the energy and building material quickly, ensuring that, by the time you do your first rep, the supplement has already taken effect. In this manner, the supplement will keep you going for longer, and ensure that your muscles recover more quickly. Last but not least is the Scivation Xtend BCAAs. Another in the line of stellar supplements, the Scivation makes sure your body gets the best of the best, and the cleanest of the cleanest. Scivation features leucine, valine, and isoleucine, all of which are essential for fast and proper muscle growth. Not only that but the amino acids featured in the product increase your metabolism, making themselves more easily processed and more easily absorbed. Of course, muscle growth is just one job the supplement does. The other two are energy and recovery. Scivation grants better energy input, allowing you to work our longer and harder, and ensuring that your muscles don’t feel too sore afterward through mitigation of tissue damage. And that’s it for our BCAA supplements for women. We made sure to pick the absolute best ones on the market, the ones that will provide you with the most benefits. These products all come from relatively well-known brands, and have been tried and tested by countless users before we made this list and wrote the reviews, so, if you don’t trust our judgment, you can trust fellow fitness junkies like yourself.